Are you having trouble finding wedding dresses with sleeves long or short? You may be a mature bride looking for a gown with sleeves because you want a modest wedding dress that will provide more coverage. Finding one with long sleeves is very difficult but not impossible to do. 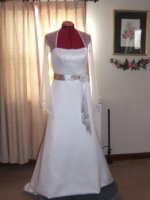 Sometimes it is because of religious requirements that you may need a long sleeve wedding dress. Most of all, sleeves provide the extra coverage that most older brides like. Make sure that the sleeve on a short sleeve wedding dress stops at the right spot.. Stopping right at the bustline can cause attention to this area for those with a prominent bust. Short sleeves stopping at the upper arm in the wrong place can make your arms look larger. Make sure the sleeve stops well above or below the widest part of your arm. Three-quarter sleeves stopping around your hips will draw attention to this area. If you have wide hips or thighs you have to be careful with this length. Slim fitted long sleeves can be slimming. But sleeves that fit like a second skin can make a person with large upper arms look larger and draw attention to them. Be careful of long sleeve wedding dresses that have sleeves that billow out like juliet and poet sleeves. This style of sleeve can add width to your overall appearance. Because of the popularity of the strapless bridal gown style finding sleeved wedding dresses may seem impossible. But I was able to find a few wedding dresses with sleeves. Not just short sleeves but they have quite a few long sleeved wedding dresses. Look at the examples below. In the above pictures you see that there are variety of sleeve styles and lengths that you can consider. When you try on wedding gowns with sleeves. Always pay attention to the length placement on your arm and in proportion to your body. When looking in the mirror make sure your overall appearance is slimming and not just zero in on covering up your arms because you feel they are not as toned or slim as you want them to be. Also you can see above that in some cases there is a jacket with the dress. Some designers make jackets that come with the gown or can be ordered separately. If you find a gown that is strapless and it doesn't have a jacket... you can buy one separately even if it is from another designer. Just make sure the design and the fabric of the jacket works with your dress. Considering having a winter wedding? Check out some of my favorite long sleeved wedding dress designs. Take a look at these short sleeved wedding dress designs.